First, cook bacon in saucepan, remove and set aside, saving a bit of the grease in the pan. Cook the onions in the bacon grease until tender. Add beans and brown sugar to the pan, mixing thoroughly. Transfer to oven dish, place bacon strips on top of mixture and bake at 350 for an hour and a half. Beans have many health benefits, including antioxidant properties and fiber content. 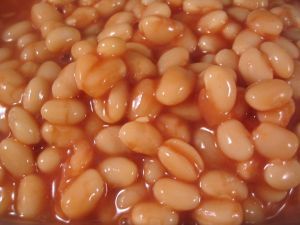 Experiment with the many variations and healthier bean recipes as well, like red beans and rice with a glass of milk; simple and divine!